Kihunters (キハンター星人, Kihunterian) are enemies that appear in the Metroid series. A swarm of Kihunter surrounding Samus in Metroid: Other M.
Kihunters are insectoid enemies introduced as Space Pirates in Super Metroid, where they assisted the Zebesian Space Pirates in rebuilding their base on Zebes. 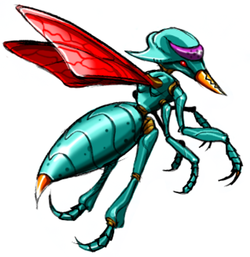 Zero is their larval stage, as revealed in Metroid Fusion. They appear again in Metroid: Other M, the source of their Smash design, where they were cloned and bred for use as biological weapons. They are led by King Kihunter. 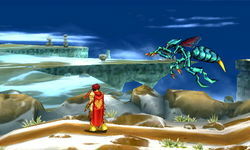 Kihunters appear as flying enemies. They attack by spitting paralyzing globs of acid or, when close enough, by charging at the player. Creatures hailing from the Metroid series. They start off life as a Zero, growing into this bee-like form. Kihunters prefer to attack with quick dashes and by spitting gobs of acid. Definitely dodge the acid—it stuns you and goes through shields. Defeated Kihunters drop Jump stat boosts. These insectoids from the Metroid series emerge from their larval form known as a Zero. Kihunters attack by either charging at you from above or spitting acid. That acid can paralyse you, and it'll even cut through your shield, so dodge to avoid getting hit. If you defeat a Kihunter, you'll get Jump stat boosts for your troubles. This page was last edited on December 17, 2018, at 18:14.